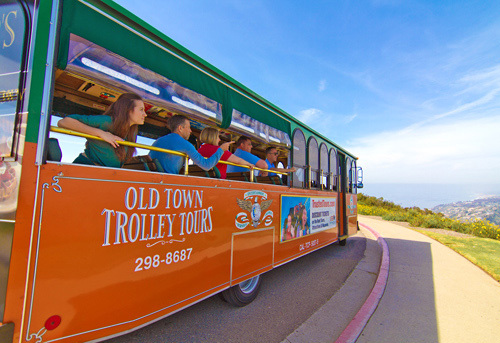 Featuring a 110-minute, 24-mile continuous beach shuttle ride, Old Town Trolley La Jolla-Mission Beach Tour offers great music, historic information, scenic 360-degree views and more for the whole family to enjoy. Guests can experience the best of the San Diego area, including views of Mission Beach and Belmont Park, Veterans Memorial, Old Town, and the Pacific Ocean. Trolleys come by every hour. Tour is 1.5 - 2 hours if you don’t depart for stops. Sights include Mt. Soledad, La Jolla, Mission Beach and Old Town. Easy way to experience San Diego beaches. San Diego is known for 70 miles of beautiful beaches and mild temperatures. What better way to get you there than the Old Town Trolley Tour! 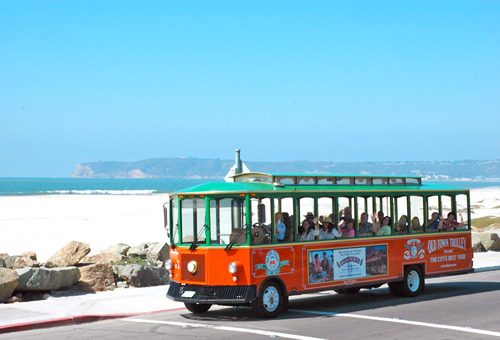 Hop onboard our one-of-a-kind beach trolley and let us shuttle you to Mt. Soledad, La Jolla, Mission Beach and Old Town. There is something for everyone, from expansive sandy beaches, rocky cliffs, reefs, tide pools and everything in between. The beaches in San Diego are as varied as the California beach towns that were built around them. Discover beaches perfect for families and coveted by the world's top surfers. Play volleyball, spot creatures in tide pools or simply relax and people watch. The fleet of colorful orange-and-green trolleys travel on a continuous loop beginning and ending in Old Town with a 20-minute photo op atop Mt. Soledad and 3 1/2 hours in the Village of La Jolla. The Trolley will tour Pacific Beach, Windansea Beach and Mission Beach on the trip back to Old Town from La Jolla Village. So grab your beach towels, slather on the sunscreen, get your eTickets for the Old Town Trolley La Jolla & San Diego Beaches Tour, and get out to explore some of the finest beaches in the world! Mt. Soledad featuring the Veterans Memorial with 360 degree panoramic views of San Diego and the Pacific Ocean. 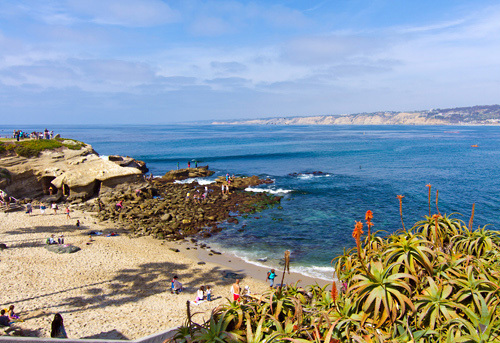 La Jolla featuring the La Jolla Cove and children's pool and nearby shopping in the Village that rivals Rodeo Dr.
Pacific Beach, Windansea Beach and Mission Beach. Old Town, the birth place of California, featuring the historic state park. Premier ocean and beach views along the route. Depart Old Town--4010 Twiggs St. - pick up 10:15AM. Stop #1--Mt. Soledad-stop located at the top of the memorial with a short photo-op. Final pick-up for remaining Beaches and return to Old Town - 3:00PM. It lasts 110 minutes if you don’t get off. Otherwise, make an entire day of the hop-on, hop-off tour with 4 different stops in La Jolla, Mission Beach, Mt. Soledad and Old Town. You may hop on and off at any one of our convenient stops throughout the entire day. The Trolley Tour begins every day (except Thanksgiving and Christmas) at 10:15am at the Old Town Depot; however, you can begin your tour at any of our stops. Please note: Each stop has a different starting time. Our trolleys come by approximately every hour, though times may vary slightly due to traffic conditions and city events. During peak times, we cannot guarantee that each trolley will have available seats. Our Old Town Trolley Depot is located at the Old Town Market on 4010 Twiggs Street and San Diego avenue in the heart of Old Town San Diego, the Birthplace of California ...about four minutes drive from the "Old Town Exit" on Interstate 5. Public transportation and parking is available at this stop.